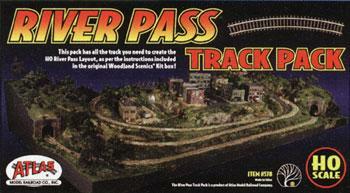 This Track Pack Contains All the Atlas HO Code 83 Track You Need to Complete Woodland Scenics River Pass Layout Kit. Retail $119.95 SAVE 24% ! "Excellent Atlas Kit & Service by Woodland"
I purchased the Woodland River Pass Kits, Layout, Scenery, Building and Track Pack by Atlas. Evidently someone helped themselves to the track connectors and one 6 track. I called Woodland and they immediately replaced the missing items for me at no cost. I have the track layout down permanently on the River Pass and it&apos;s absolutely great. Very smooth rails and aligns very easy. I definitely would recommend this kit to anyone, just be sure to inventory the kit when opening. The customer service with Woodland is outstanding!! All the track you need to create the HO scale River Pass Layout, as per the instructions included in the original Woodland Scenics Kit box (WOOU9184). Atlas HO Code 83 track is the choice of modelers of all skill levels and has become the new standard in model railroading. Prototypically-fine brown ties and nickel silver rail. Warrent Truss Bridge assembly kit with realistic wood grain details.